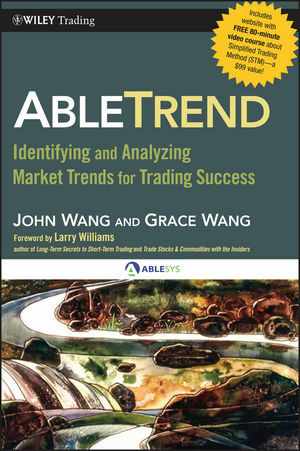 In AbleTrend, Dr. John Wang discloses for the first time, the fundamental principles behind his bestselling and award-winning trading system, AbleTrend signals. Sophisticated in scope, yet written in a way that any trader can understand, this book skillfully presents the theory behind this award-winning system. This reliable resource presents the logic of a proven system that reveals the direction of a trend at its early stage in all markets-stocks, commodities, foreign currencies, ETFs, e-Minis, and mutual funds. It also identifies objective, automatic buy/sell/stop signals, helping you manage risk, make rational trading decisions, and eliminate the guesswork. AbleTrend presents innovative decision-making trading concepts that will allow ordinary traders to identify market trends and seek profits from them. John Wang (Hayward, CA) is co-founder, chairman, and CEO of AbleSys. He co-founded AbleSys Corp. in 1994, and created the Spyglass Trading system in 1992, ASCTrend indicators in 1995, and developed the eASCTrend trading system in 2000. AbleTrend 7.0 was launched in 2000. Dr. Wang holds a B.S. in chemical physics from the University of Sciences and Technologies of China (USTC), an MS in quantum chemistry from Zhongshan University, and a Ph.D. in major physical chemistry from University of California Santa Cruz where he was awarded a Regents Fellowship. His research has been published in top scientific journals including Chemical Physics Letter and the Journal of Physical Chemistry, among others. He was a senior and chief scientist at TeloSense Corp. Dr. Wang began trading commodities in 1990 and is an active trader today, registered as a CTA (Commodity Trading Advisor. Dr. Wang's extensive backgrounds in both trading and natural science make him uniquely qualified to create and test computerized trading systems. Grace Wang (Hayward, CA) is vice president of AbleSys and received an MA in sports psychology in 1987 from California State University Sacremento, and an MA in physical education and gymnastics from Shanghai Institute of Physical Education in 1981. Grace became a CTA in 1995 and has been a frequent panel speaker at financial trade shows since 1999.